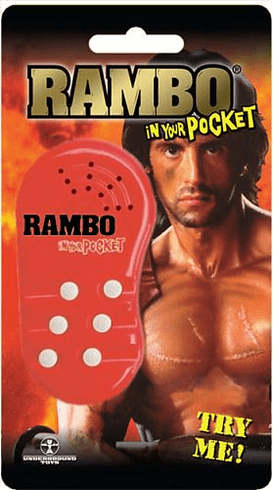 Complete with six phrases from the Sylvester Stallone- starring blockbuster series, the spirit (and sounds) of John J. Rambo will never be far away! Includes the following phrases: "There's no rescue team, there's just me." "I want, what they want. And what every other guy who came over here who spilled his guts and gave everything he had, wants. For our country to love us as much as we love it." "Mission accomplished." "You know there's more men out there. You know who they are. Find 'em or I'll find you." "My war is over." "They drew First Blood, not me."